New York, June 21, 2013—James B. Comey, a lecturer-in-law, senior research scholar, and the Hertog Fellow in National Security Law at Columbia Law School, was nominated by President Barack Obama today to become the next director of the Federal Bureau of Investigation. 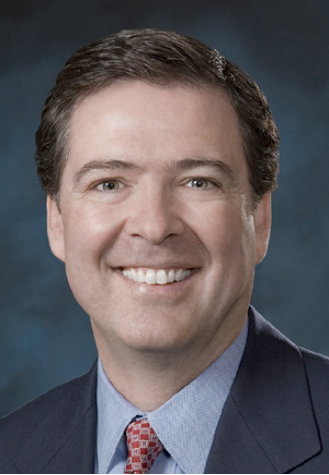 Comey, former deputy attorney general of the United States, joined Columbia Law School as part of the Roger Hertog Program on Law and National Security, which draws its unique strength from its faculty, each of whom has held senior-level positions in government. As a lecturer and senior research scholar in law and national security, Comey shared both his experience and perspective with students and faculty, while also expanding the Columbia Law School curriculum in national security law. Two new courses will debut in the coming academic year that were jointly created by Comey and Professor Matthew C. Waxman, the faculty chair of the Roger Hertog Program on Law and National Security. National Security and Legal Decision-Making will focus on lawyering within the context of recent national security controversies, with special attention paid to legal reasoning, the role of lawyers in government, and the responsibilities of lawyers in leadership roles. Intelligence, Surveillance, and Privacy Law will examine theory, doctrine, and current policy on the regulation of government intelligence and surveillance activities. “Jim’s insights into teaching national security law have been invaluable, not only as they related to the cutting-edge issues we read about every day in the news but also for their viewpoint on the professionalism and integrity that is so important in the field,” said Waxman. From 2003 through 2005, Comey served as deputy attorney general of the United States, supervising the operations of the Department of Justice and chairing both the president’s Corporate Fraud Task Force and the Presidential Board on Safeguarding Americans’ Civil Liberties. Prior to becoming deputy attorney general, Comey was the United States Attorney for the Southern District of New York. He oversaw numerous terrorism cases and supervised prosecutions of executives of WorldCom, Adelphia, and Imclone on fraud and securities-related charges. He also created a specialized unit devoted to prosecuting international drug cartels. As New York’s top federal prosecutor, Comey investigated and prosecuted a wide variety of cases, including those dealing with firearms, narcotics, corporate malfeasance, violent crime, public corruption, terrorism, and organized crime. In 1993, as an assistant U.S. attorney and deputy chief of the criminal division for the Southern District, he served as lead prosecutor in United States v. John Gambino, a six-month mafia racketeering and murder trial. At Columbia Law School, Comey found some familiar faces among the faculty. From 1996 through 2001, Comey was managing assistant U.S. attorney in charge of the Richmond Division of the United States Attorney’s office for the Eastern District of Virginia. Comey handled the Khobar Towers terrorist bombing case, which arose out of the June 1996 attack on a U.S. military facility in Saudi Arabia that resulted in the deaths of 19 military personnel. Since 2012, Comey has served as a member of the Defense Legal Policy Board, which is charged with providing independent advice to the Secretary of Defense. Prior to coming to Columbia Law School, Comey also held high-ranking positions in the private sector. He most recently worked from 2010 to 2013 as general counsel of Bridgewater Associates, an institutional money manager in Westport, Conn., where he oversaw the legal, compliance, and security departments. From 2005 to 2010, Comey was senior vice president and general counsel of the Lockheed Martin Corporation, responsible for management of the corporation’s legal affairs and its law department. In this role, he also served as principal counsel to Lockheed Martin Corporation’s senior leadership and the board of directors. Earlier this year, Comey was appointed a director of the board of HSBC Holdings and a member of the board’s Financial System Vulnerabilities Committee, which helps identify areas where the bank and the financial system more broadly may become exposed to financial crime or system abuse. View and download high-resolution photos of James Comey.